by Chris Woodford. Last updated: February 17, 2019. Think "sport" and the words that spring to mind are likely to be fitness, exercise, competition, endurance... and fun; "science" is probably not among them. It's obvious to anyone who loves sport that it's a powerful demonstration of pushing the human body its limits. What's less obvious is that sport is an equally powerful demonstration of science. From the cutting-edge composite materials packed into racing bikes and tennis rackets to the 17th-century maths that bends baseballs through the air, science is the foundation of almost every sport you care to mention. How can Usain Bolt sprint so much faster than you? Is a wooden baseball bat going to make you play better than one made from aluminum? Exactly what's happening to a soccer ball as it curves off your boot, swerves through the sky, and punches into the net? As you'll see in a moment, questions like these have fascinating, scientific answers! Photo: Golf: You learn to play a game like this by hitting a ball hundreds or thousands of times. Your brain learns to correlate the way you move your muscles with the places where the ball ends up; eventually, after enough practice, you can place the ball wherever you want. In theory, a robot could play just as effectively if you programmed it with the laws of physics, or if you let it practice and learn from its mistakes using a neural network (a type of computer model that learns from experience like a brain). 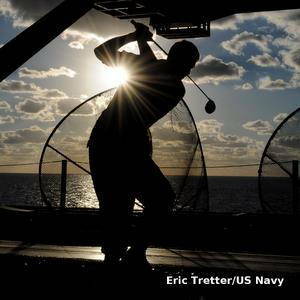 Photo by Eric Tretter courtesy of US Navy. Why do we say sport is scientific? Science is all about understanding how the world works using theories tested through experiments. At first sight, sport appears to be something different: training hard to beat an opponent (another person or team, a clock or measuring tape, or maybe just that pesky little voice inside your head that keeps pushing you to do better). Look into sport a bit more closely and it soon becomes obvious that science plays a big part in it. The human body itself is obviously a scientific miracle that can turn a hearty breakfast into a soccer championship, a record-breaking sprint, or a heavyweight boxing title. But leaving the basic biology to one side, there are many more ways in which sport relies on science. Physics, for example, tells us how far you can hit or throw a ball, but it also explains how fast a swimmer can cut through the water, how a diver can somersault, and even why long jumpers have to move their arms in such a drastic way as they fly through the air. Let's look more closely at the science behind a few different kinds of sports: ball sports (including tennis, soccer, and baseball), track and field (athletics), speed sports (such as cycling and swimming), and sports that defy gravity and balance (gymnastics, BMX and skateboarding). If you've studied physics at school, you'll know that we can use a few relatively simple math equations to predict the parabolic (upside-down U-shape) path of an object flying through the air. The science is called ballistics—and it governs everything from how bullets fire out of rifles to how cricket balls soar through the sky. The basic idea is simple. When you throw or hit a ball upward, you apply a force that makes it accelerate (gaining both a vertical and a horizontal velocity). The vertical (upward) velocity and the horizontal (sideways) velocity are independent of one another, though both are important if you're trying to make a ball go as far as possible. As the ball shoots up, the force of gravity pulls it back down, slowing its vertical velocity to zero (when it reaches the peak of its trajectory) and then accelerating it back toward the ground. It's easy to calculate how long the ball will stay airborne and, using this, you can figure out how far it will travel (its range, in other words) by multiplying the time in the air by the ball's horizontal velocity. 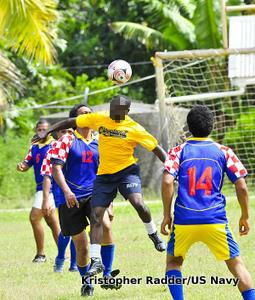 Photo: Scoring a goal: sheer skill or cunning physics? Your brain calculates the trajectory of the ball and figures out how to kick it to reach a particular spot. If there are people in the way, you might spin the ball so it curves through the air and bends around them. Skillful players learn how to do this by trial and error, but a scientist could also figure out how to achieve the same effect using the laws of aerodynamics. Photo by Gary Nichols courtesy of US Navy. When you try to hit or kick a ball as hard as you can, what you're attempting to do, in scientific terms, is transfer as much kinetic energy from your body to the ball as possible. In a sport where you use a bat, the bat serves as a go-between in the process, helping you to transfer energy more efficiently. One of the really interesting things about ball sports is the wide range of different bats and balls that are used; although the basic dimensions of the bat and ball may be specified in the rules of a particular sport, you can still find huge variety. Bats come in all shapes and sizes, in woods of various kinds, metals such as aluminum, and high-tech composites and carbon fibers; the design of a bat has a huge effect on how a ball with respond, and different bats will give very different results even if you apply exactly the same force. Balls are hugely varied too: everything from perfectly smooth, very hard billiard balls and slightly softer golf balls (with their aerodynamic dimpled surface), through cricket balls and baseballs (with their complex outer stitching patterns called "seams"), and squishy rubber tennis balls, right up to soccer and basketballs and those weird-shaped rugby footballs. Photo: Soccer uses a medium-sized, fairly soft, inflatable ball. Heading involves an inelastic collision in which momentum and energy are transferred imperfectly from your head to the ball. Imagine what kind of soccer boots you'd need to wear if soccer balls were made out of solid wood. According to my quick calculations, a wooden soccer ball would be about nine times heavier, so you'd need to give it nine times more energy to kick it to the same height. If all that energy came from your leg, your leg would need to be moving about three times faster during the kick to have nine times more energy to pass on. You'd need to use nine times more force to kick a stationary wooden ball to the same speed or kick with the same force for nine times longer, neither of which sounds possible. Using so much force to kick the ball would tire the players very quickly and make the game much less interesting. Photo by Kristopher Radder courtesy of US Navy. Not all sports use hard bats and balls. In some sports, we use part of the human body (our arms or legs) or a softer instrument (maybe a tennis racket) to accelerate a lighter and softer ball that's typically filled with air or some elastic material. Kick a soccer ball and what happens is very different to what goes on when you whack a golfball with an iron club. What we get is a much more inelastic collision where the ball initially deforms and squashes inward as you kick or hit it, then springs back to shape and pushes away from your foot. In collisions like this, kinetic energy isn't conserved: the ball and your body have less energy after the collision than your body had beforehand. Balls like this are generally much lighter and (fortunately) we don't need to hit or kick them quite so hard to accelerate them to high speed. 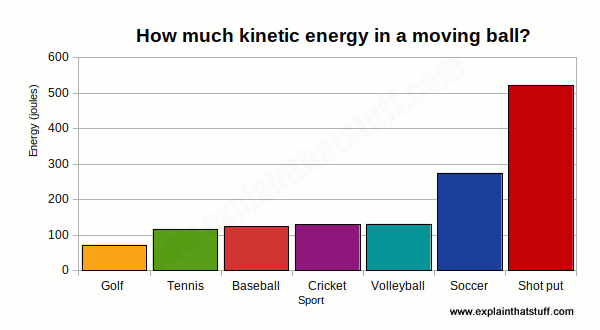 Chart: Which sports balls have most energy? We can figure out the kinetic energy of a ball with the formula ½mv2. Plugging in the masses and (higher-end) speeds, we get these sorts of estimates. I would have guessed that golf balls had most energy because they seem to be going so fast, but they're also very light. Soccer balls, kicked hard, have surprisingly high energy because they go faster than you think and weigh almost 10 times more than golf balls. Which balls hurt most when they hit you? Generally, harder and smaller balls (golf balls) because they dissipate their energy very quickly over a small area, which means they exert more force and pressure on your body. That's also the idea behind bullets, except they're pointed to move faster and help penetrate your body. Interestingly, if you check out the similar chart I drew in my bullets article, you'll find modest handgun bullets have comparable energy to fast-moving sports balls (hundreds of joules). Why use a bat at all? Why not just play tennis, cricket, or baseball with your arm and hand the way you kick a soccer ball with your feet? Two reasons for using a bat are obvious. First, it can obviously be made bigger than your hand, so it's easier to connect with a faster ball, which makes the game more fun and more competitive. Second, a bat is less fragile than the human body so you're less likely to hurt or tire yourself. A cricket player might, conceivably, have to bat a ball hundreds of times during a match and play matches like that week after week, year after year. The human hand contains 27 relatively delicate bones; imagine what would happen if it got the kind of beating a cricket bat gets! The other reason for using a bat is much more subtle and interesting: it helps you to transfer energy from your body to the ball. The design of the bat (how long and wide it is, whether it's solid or hollow, whether the weight is distributed closer to the handle or the batting end, and so on) makes all the difference to how efficiently the energy is transferred. For example, a solid wooden baseball bat will have more momentum (because of its heavier mass) than an identical sized but hollow aluminum bat moving at the same speed, so if you connect with the ball, you should pass on more energy. Then again, if the bat is lighter, you can move it into position more quickly and swing it faster, so its higher speed should compensate for its lighter weight in helping you to pass on your momentum. Which factor is most important? That depends partly on your batting style and personal preference—and partly on the build of your body. In his excellent book Physics of Baseball and Softball, Rod Cross explains that you get very effective energy transfer from your arm to a ball when a bat is about six times heavier than a ball and six times lighter than your arm or arms (typical of baseball bats and tennis rackets). You need to have roughly the same ratio in each case (arms to bat, bat to ball) so if you had heavier and more muscular arms, you might be better using a heavier bat than a lighter one. If you're fairly muscular and you're trying to hit a heavy ball, there's no point trying to do it with a bat that's too light, because it won't pass on the energy and momentum from your arms efficiently. Similarly, if you have thin weedy arms (like me), a lighter bat might prove more effective. Different balls sports are played on different surfaces—and over different sized areas—and that also plays a big part in the balls we use and how they're designed. One reason is because balls made from different materials bounce to different heights, even on the same surface; the same ball also bounces very differently on different materials. 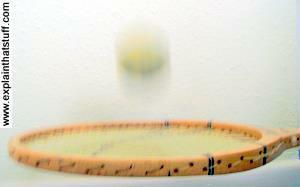 You might have noticed how tennis players often specialize in playing on a particular surface such as clay, asphalt, or grass; each of these affects the speed and bounce of the ball in a radically different way, with softer clay absorbing more of the ball's energy and effectively slowing down the strokes, and grass speeding them up. There's no reason why we couldn't play golf on a table top with clubs the size of pencils and balls made of cotton—but it wouldn't be a very interesting or challenging game. Golf is a game people like to play outdoors over long ranges and that decrees the type of ball needed to play it. The ball has to travel a relatively long way (at least in the initial "drive"), so it has to be small to reduce air resistance. (The dimples on a golf ball help it to travel further by reducing the drag even more.) To stop it from being deflected too much by the wind, it has to be relatively dense and heavy—and that means the thing you hit it with (the club) has to be dense and heavy too (made from wood, metal, or carbon fiber, golf clubs have a thin shaft and a heavy weight at the end where they contact the ball). Different people can achieve very different effects with the same bat and ball. Tennis is a subtle game that can be played in many different ways, but one of its key features is the serve: the fast, powerful opening shot. 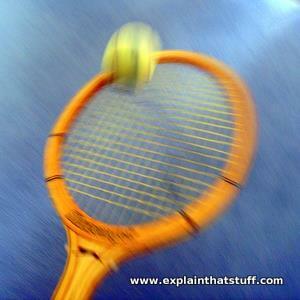 Taller players with longer arms naturally have an advantage here: the taller you are and the higher you reach, the faster the tip of your racket is traveling when it hits the ball (because the velocity of any point on a rotating wheel is greater as its distance from the point of rotation increases) and (in theory) the faster the ball will go when it blasts toward your opponent. 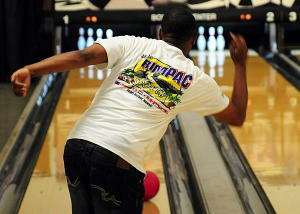 Photo: When you bowl, your brain instantly works out how to control your muscles to throw the ball to reach a precise position in space. On paper, that's simple physics, but it's amazing that our brains and bodies can do things like this instinctively, with no calculations at all. Photo by Jon Dasbach courtesy of US Navy. What do world-class footballers, cricket and tennis players, baseball champs, and even billiard players have in common? An instinctive ability to put a ball precisely where they want it to go, and often where their opponent least expects it. That doesn't just mean being able to hit or kick a ball as far as possible, but using things like spin to make it curve to one side. Spinning balls bend because of science—usually through something called the Magnus effect: as a ball spins, it changes the way air moves around it, speeding it up on one side and stopping it on the other, producing a force that pushes the ball in an unexpected direction. Balls with seams and cricket balls that have been polished on one side curve through as they fly because they make the air more turbulent on one side than the other. It's much easier to see these things demonstrated in videos and animations than to read about them. Derek Muller of Veritasium and Australian physics professor and sports-physics expert Rod Cross have made two great YouTube videos showing how these effects occur: the first is a simple demonstration of how the Magnus effect makes a ball curve; the second explains the physics of balls with seams. Track and field sports are contests in which each individual athlete pits their body against other people's bodies; attempting to run faster, jump higher, or throw further is the name of the game. Although much of athletics is about harnessing the biology of the body—using the strength of individual muscle groups, for example—there's a lot of science going on outside the body too. Who'd guess that a long jumper or a pole vaulter is secretly harnessing the power of physics? 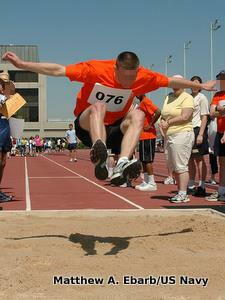 Photo: Long jump is all about conservation of energy and momentum. Once you're airborne, there's no way to get any more energy, so the run-up is crucial: the more kinetic energy you give you body the further you'll go. In midair, you can move your legs further forward by bringing your arms around and down, as this jumper is just about to do. Photo by Matthew A. Ebarb courtesy of US Navy. You might think the long jump it's simply a matter of running fast, hurling yourself into the air, and hoping for the best. Not if you want to win a gold medal! As a jumper, what you want to achieve is to land your legs as far forward as possible (in front of your body), but you can't possibly take off with them in that position: they have to be pushing backward (behind your body) to launch you into the air. So what you have to do is radically alter the position of your legs while you're in midair. Now once you're airborne, if you move either your arms or your legs away from your torso, your body will rotate about your center of gravity (the point on your body where all your mass seems to be concentrated). Moving either your arms or your legs nearer to or further from your body will change your moment of inertia (the distribution of your mass about your center of gravity). It's a basic law of physics that your angular momentum (the momentum your body has because it's rotating) cannot increase or decrease (angular momentum is "conserved," as physicists say). If you want to throw your legs forward and outward, the way to do it is to throw your arms upward, then bring them down quickly. As your arms shoot back, your legs shoot forward to compensate. It's a bit like when you're swimming and you want to stand up: if you bring your arms down quickly in front of you, your legs shoot down beneath you to ensure the conservation of angular momentum. Almost the same move happens mid-air in the long jump. Pole vaulting is another example of a sport where physics can give you a hidden hand. Pole vaulting is a bit like a super-high high jump where you use a long, bendy, carbon-fiber pole to throw yourself over a bar. Just like long jump, it looks simpler and less scientific than it really is. And just as long jump is all about the conservation of angular momentum, so pole vaulting is about the conservation of energy. Consider what happens during a pole vault: you start off running toward the bar with the pole in your hands. After you've picked up speed, you have a fair bit of kinetic energy (energy of movement because you have both mass and speed). To lift your body a certain distance in the air, you need to give it a certain amount of potential energy. The pole helps you convert horizontal into vertical motion, and it does so by converting your kinetic energy into potential energy. After you've reached the end of your run-up, you stick the pole into the ground. Your momentum and energy is now transferred into the pole, which bends into a curve and converts your kinetic energy into elastic potential energy, slowing you down in the process. Being elastic, the pole quickly springs back to its original shape, straightening out and lifting you upward, and converting its elastic potential energy into kinetic energy and gravitational potential energy (the energy your body has when it's up in the air). Ideally, all of the kinetic energy you had in the run-up is converted into potential energy when your body reaches its highest point and stops climbing. That explains why the run-up is so crucial to a pole-vaulter: if you don't run at top speed, and plant your pole correctly or hold it firmly, your kinetic energy won't be completely converted to potential energy and you won't gain as much height. Artwork: Pole vault is a good example of the conservation of energy. 1) During the run-up, your body tries to gain as much kinetic energy as possible. This is vital because, once you're airborne, there's no way to gain extra energy. 2) When you stick the pole into the ground, it bends and converts your kinetic energy into elastic potential energy. 3) As the pole straightens, it gives the kinetic energy back to your body. The pole's job is to help you convert kinetic energy (your running energy) into potential energy (the energy you have when you climb into the air) and horizontal motion into vertical motion. 4) When you let go of the pole, you're climbing upward, working against the force of gravity. Your body's kinetic energy is gradually converted to potential energy as you climb, which is why you start to slow down. 5) At your highest point, as you cross the bar, your body has maximum potential energy. All the energy you have at this point came from the kinetic energy of your original run-up. Physics is even at work in the simplest sport of all—running—and it can help us understand why a super-star like Usain Bolt can run so much faster than the rest of us. According to Newton's second law of motion, you can make a mass accelerate (gain speed) by applying a force to it. We can describe the same law in a slightly different way: you can give something more momentum by applying a force to it for a certain amount of time (with what's called an impulse). If you're a world-class sprinter, what makes you run faster is your ability to deliver impulses with your legs that accelerate you faster. But the more massive you are, the more force you need to accelerate. If you have huge muscular legs, you'll need more force to pick them up and put them down and keep your body moving quickly. In the case of Usain Bolt, a very large and tall man, his ability to generate powerful impulses with his legs (to gain acceleration) outweighs his considerable mass (which needs more force to accelerate it). And that's why he's so fast. Photo: Aerodynamics is as important to cyclists as it is to designers of race cars and jet planes, which is why they wear tight clothes and lean forward like this. 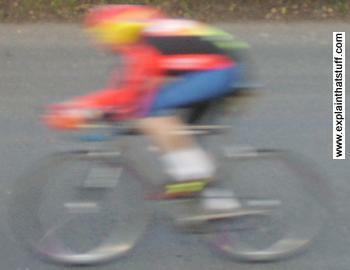 Although you can't see it in this photo, racing cyclists also use special handlebars that position their elbows much closer to their torsos, significantly reducing drag. Cycling, swimming, skiing, and bobsleigh are all about beating the clock—but they're also about beating another type of science called fluid dynamics, which is the physics of how liquids and gases (fluids) move around objects (or how moving objects slice through fluids, which is exactly the same thing). Have you noticed how Olympic swimmers wear those super-streamlined body suits and cyclists put on teardrop-shamed helmets and crouch over their bikes? The reason is the same in both cases: the swimmers are trying to minimize the resistance their body offers to relatively dense, liquid water, while cyclists (who move quite a bit faster) are attempting to reduce air resistance (drag) by making their bodies more aerodynamic. Most of us don't notice air resistance because we never really go fast enough; when you're walking, gravity is the force that causes you most bother. You certainly notice the force of air resistance on a cycle—and it's very obvious if you speed along in a car with the windows or the roof down. 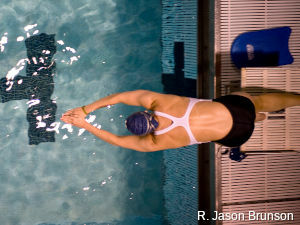 Drag is even more of a problem for swimmers because water is so much more dense than air. It's much easier to swim (horizontally) through water than to walk through it (vertically) because your body assumes a tube-like shape that can move forward by pushing less water out of the way (it has what we call less form drag because it presents less of an obstacle to the water trying to move past it). Those streamlined suits you see swimmers wearing work in two very interesting scientific ways—one involving biology, the other physics. The biological effect is achieved with tight-stitching throughout the suit that compresses the swimmer's muscles so they work more efficiently, producing less fatigue. The physical effect comes from the texture of the suit. There are tiny V-shaped ridges on the surface designed like the dermal denticles (placoid scales) on a shark's skin. These help to reduce friction drag (the resistance between your body and the layers of water sliding past it) by creating tiny vortices, reducing the water's tendency to become turbulent as it flows past your skin. If you're doing a speed sport, understanding how to minimize form drag and friction drag is the way to go faster, but it's also the way to go further. Pushing against the air or the water wastes energy, and there's only so much of that available to your body. The more efficiently you use your limited energy supply (the further you go with each stroke or your arms or push of your legs), the longer you can go without getting tired. If you're a tennis or golf player, your brain has an intuitive understanding of ballistics: you know exactly where a ball will go when you hit it. If you're a cyclist or a swimmer, you learn about fluid dynamics very quickly. On the track or field, you soon master force, energy, and acceleration even if you don't actually think about them scientifically. What about sports like skateboarding and BMX? What science do they involve? Skating is a supreme demonstration of physics. Even the most basic move of all—kicking against the curb to get yourself moving in the first place—is an example of Newton's third law of motion: you kick back against the curb to make your body and the board go forward. Pull off a cool stunt in mid-air and you're nothing less than a mini Albert Einstein: you're instinctively harnessing the power of physics to maintain your balance, which we can define as the way your body keeps itself upright despite gravity's pesky determination to pull it to the ground. The general approach to skating is to bend your knees and stand in a kind of flexed position. Why? The lower you stand, the lower your center of gravity and the easier it is to keep your balance (bending your knees also helps to absorb impacts when you land and reduces the shock to your legs and spine). Photo: Skateboarders master physics instinctively: skating is all about center-of-gravity, Newton's laws, conservation of energy, and conservation of angular momentum. 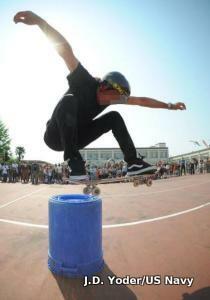 In this trick, widely spread arms give better balance by increasing the skater's moment of inertia. Photo by J.D.Yoder courtesy of US Navy. If you pull a trick where you shoot off a ramp and lift your legs off the board, so your body and your board briefly separate, travel independently for a time, then come together again when you put your feet back down, you're making use of inertia: as Newton's first law of motion tells us, objects either stay still or keep moving at a steady speed unless a force acts on them. Even though your body and your board part company for a few seconds, both keep moving in a predictable way because of their inertia, and that allows you to reconnect with your board again further down the line. Skaters put their arms out to balance their bodies. Why? For the same reason that a tightrope walker often holds a long, heavy pole. If you're trying to keep your balance on a skateboard, you're trying to stop your body from rotating. If you're on the ground, and your center-of-gravity is too far to one side (not directly over the board), the top of your body will tend to rotate about your feet: in physics terms, your body will experience a moment that will make it turn— in other words, you'll fall over! A lower center-of-gravity is one way to make balancing easier; a higher moment of inertia is another way. What that means is arranging your body so some of its mass is further from the point of rotation (in other words, you put your arms out). You'll have noticed how ice skaters can slow down their spinning moves by putting their arms out, and speed themselves up by bringing their arms in; since their angular momentum has to stay constant, bringing their arms in (reducing their moment of inertia) means their angular velocity has to increase, so they spin faster. When you're skateboarding, if your arms are outstretched and you start to lose balance, your body will rotate more slowly, so you'll have more time to compensate. Instinctively, you'll shift the position of your arms to cancel the rotation of your body, balancing yourself once more. A top skater has an instinctive ability to control his or her angular momentum—like a kind of human gyroscope! Photo: Diving is all about mastering momentum: converting linear momentum to angular momentum and conserving angular momentum as you spin. Photo by R. Jason Brunson courtesy of US Navy. Sports that involve precise rotations of your body, such as diving, are all about mastering the conservation of angular momentum. You'll have noticed how divers tuck their arms and legs in after they spring off from the board, rotate a couple of times in a somersault, then extend their limbs to enter the water cleanly and safely. Why spring off the board? It's much the same as the pole vault: the energy you put into the board by jumping down on it is temporarily stored inside the bent wood as elastic potential energy. The elasticity of the board makes it spring upward and gives your body first kinetic energy, then potential energy. As you tuck your limbs in and start the dive, your body starts to rotate so your linear momentum (your movement straight upward) is converted into angular momentum (spinning motion). Once you're diving, the conservation of angular momentum comes into play. With your arms and legs tucked tight to your body, your moment of inertia is as small as it can possibly be so you spin at your fastest speed. By extending your arms and legs, you increase your moment of inertia, slowing down and then cancelling your rotation so your body enters the water vertically, ideally without rotating. Some people are born sports players and some aren't—and no amount of science will turn a clumsy person like me into a world-class athlete. Many sporting stars understand instinctively how to be the best in their field—and that built-in understanding, gained through years of practice by trial and error, can achieve the same or better results as a theoretical, scientific approach and by totally different means. When Usain Bolt sprints for the line, the last thing he's doing is calculating how much force his legs can turn into acceleration through Newton's laws of motion. But understanding a little bit of the science behind your favorite sport can help you harness your natural abilities and achieve more; it can help you run faster, swim further, or pull off neater skating tricks. I'm not suggesting for one moment that success in sport is purely about science: many other factors, including physical ability, natural talent, endurance, courage, and determination are at least as important (and sometimes much more so). Does science take the fun out of sport? Not a bit of it: it adds an extra level to our understanding and helps us appreciate our amazing sports stars even more! NSF: Science of the Winter Olympics: Some simple scientific explanations of winter sports from the National Science Foundation. Includes videos, text articles, and lesson plans for teachers. Rod Cross: The Physics of Ball Sports: There are some great articles about ball-sport ballistics on Rod's home page at the University of Sydney. Sports Science: A Complete Introduction by Simon Rea. Teach Yourself, 2015. A good starting point for undergraduates and adults who want a more in-depth, technical introduction than I've given. This book has greater emphasis on biology than my article (covering, for example, how the musculo-skeletal and cardio-respiratory systems work, and the importance of nutrition). The Physics of Sport by Angelo Armenti (ed). Springer, 1992. The Science of the Tour de France: Training Secrets of the World's Best Cyclists by James Witts. Bloomsbury, 2016. Physics of Baseball and Softball by Rod Cross. Springer, 2011. The Physics of Cricket by Mark Kidger. Nottingham University Press, 2011. Why a Curveball Curves: The Incredible Science of Sports by Frank Vizard (ed). Hearst, 2008. The Book Of Wildly Spectacular Sports Science by Sean Connolly. Workman, 2017. A question-driven book that's easy for kids to dip in and out of, packed with activities. 288 pages for ages 9–12. Swimming Science by Hélène Boudreau. Crabtree, 2009. A 32-page overview described as "ages 8–11", but may be too simple for the older end of that bracket. Sports Science: 40 Goal-Scoring, High-Flying, Medal-Winning Experiments for Kids! by Jim Wiese. Wiley 2012. Ages 8–12, 130 pages. Visually, a little dry and dull, but the science looks solid and there are plenty of well-described activities that could be adapted into science fair projects. Do Lefties Have an Advantage in Sports? It Depends by Steph Yin. The New York Times, November 21, 2017. Left-handers appear to have an edge in ball sports, but can science explain why? Row Bots Test Whether Human Rowers Have Been Doing It Wrong by Evan Ackerman. IEEE Spectrum, June 12, 2017. How robot rowers helped to prove that humans still do it best. Olympic Athletes Are Electrifying Their Brains, and You Can Too by Eliza Strickland. IEEE Spectrum, August 23, 2016. Does science support the idea of using transcranial direct-current stimulation (tDCS) to help athletes with training? Talent Lies Within. But Where? 'The Sports Gene' Considers the Root of Athletic Success by Christine Aschwanden. The New York Times, August 12, 2013. Are great athletes born or bred? Not surprisingly, it's a bit of both. Usain Bolt: Case Study In Science Of Sprinting by Jay Holt. ThePostGame, July 26, 2011. A great article explaining why Bolt's height and strength translate into faster acceleration and speed. How it Works: The Pole Vault by Corey Binns. Popular Science, July 25, 2008. Corey explains how the conservation of energy powers a sprinting pole vaulter over the bar. Science of the NFL: Ten great short videos explaining the science of football, developed by NBC Learn and NBC Sports, with the National Science Foundation and the National Football League. Science and Engineering of the 2014 Olympic Winter Games: More sport science videos from NBC and the National Science Foundation. Dr. Skateboard's Action Science: Forces: A quick introduction to why the center of gravity plays an important part in BMX and skating tricks. Sport Science: JaVale McGee: How one top basketball player's enormous "wingspan" plays a crucial part in the stunning moves he pulls on court. Veritasium: Why a ball curves: Rod Cross gives us a simple demonstration of the Magnus effect. Veritasium: The physics of balls with seams: Rod Cross explains the difference a seam makes to the flight of a ball.